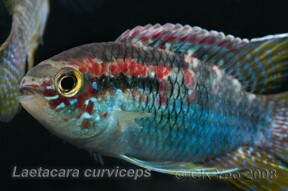 Adult male specimen from the Singapore aquarium trade. This species is one of several in the genus to possess a dark spot on the centre of the dorsal-fin base. curviceps: from the Latin curvus, meaning ‘bent, curved’, and -ceps, meaning ‘headed’. Native to the lower Amazon river basin in Brazil with some populations exhibiting differences in colour pattern to one another, particularly in respect of the degree of red and blue pigmentation on the body and fins. Type locality is given simply as ‘Amazon River, Brazil’. Field observations suggest it to display a preference for habitats containing clear, transparent water with low flow rate and little suspended sediment. In the Amazon region such environments include minor tributaries, oxbow pools and marginal lakes with substrates normally comprising a layer of leaf litter with macrophytes including Cabomba, Myriophylum and Eichhornia spp. 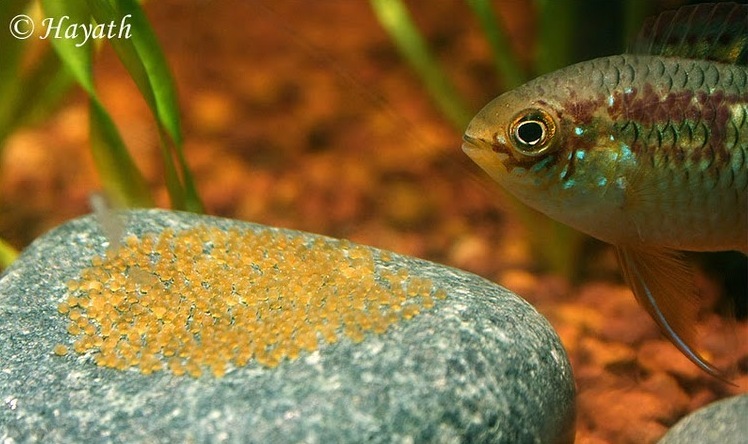 Wild fish are probably foragers feeding on algae, organic detritus, small insects, worms, crustaceans, and other zooplankton. 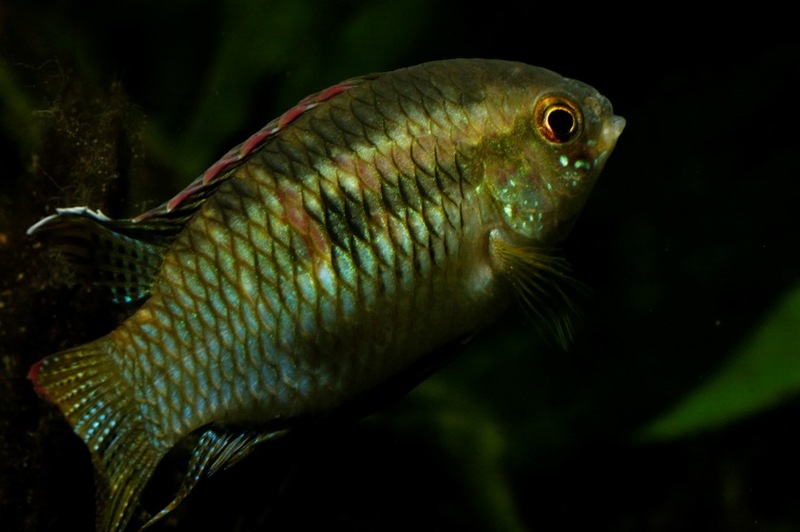 This species is an established aquarium favourite and has also been referred to as ‘flag acara’, ‘smiling acara’, ‘sheepshead acara’, and ‘blunt-headed cichlid’. 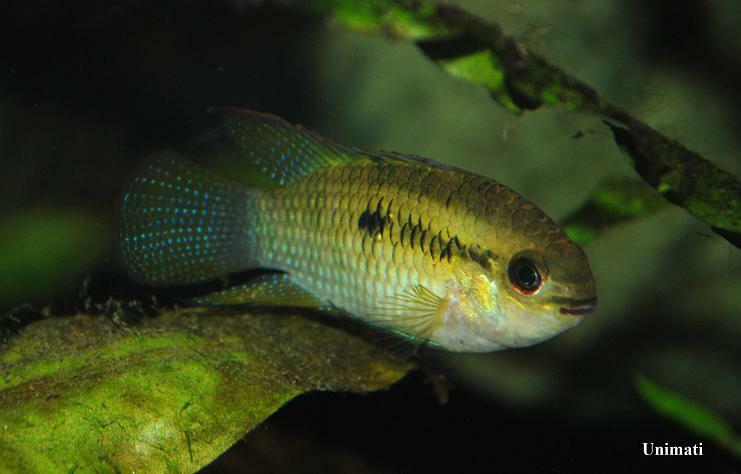 The genus Laetacara currently contains seven valid species and L. curviceps can be told apart from all congeners except L. dorsigera and L. flamannellus by possessing (vs. lacking) a dark spot on the dorsal-fin base, though this is not present in all males. In addition it differs from L. thayeri by possessing weakly ctenoid scales on the sides of the head (vs. strongly ctenoid) and a dark spot at the caudal-fin base (vs. no such spot), from L. flavilabris by having fewer total vertebrae (24 vs. 26), from L. araguaiae by having more proximal radials on the dorsal-fin base (22– 23 vs. 21), from L. fulvipinnis by the lack of a dark dot at the edge of each scale on the midlateral portion of the flank (vs. presence), from L. flamannellus by lacking (vs. possessing) an orange-coloured ring around the basal dorsal-fin spot, and from L. dorsigera by having a deeper head (head depth 84.6–88.9 % of HL vs. 90.2–96.3 % of HL), a longer pelvic-fin spine (pelvic-fin spine length 15.5–19.7 % of SL vs. 11.7–15.4 % of SL), fewer teeth along the posterior margin of ceratobranchial 5 (19–20 vs. 21–24) and no prominent red belly in breeding specimens (vs. breeding males and females with conspicuous red cheeks, opercula and belly). 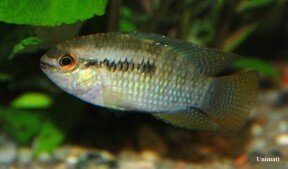 There is some confusion surrounding the year in which L. curviceps was described with the majority of sources stating 1923 whereas the year of publication actually appears to be 1924 (Ottoni et al., 2009).